Held in conjunction with the hula kahiko performance, please join us for Nā Mea Hula” (all things hula). 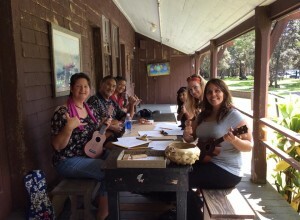 This month, Volcano area musician Wes Awana shares his love of ‘ukulele and Hawaiian music by giving family-friendly lessons on the iconic and inviting ‘ukulele. These cultural demonstrations are hands-on and family friendly and occur from 11am – 1pm on Hula Kahiko performance days.